Q – How is a tiny house a better option than a camper? A – Tiny houses are usually built to “normal” house standards, meaning with lumber and house-worthy materials. A tiny house should last you much longer than a camper and is also likely better insulated. Additionally, you can customize a tiny house easier than you can alter a camper. These houses also feel more like a home…that’s really a subjective thing, but important for some people. 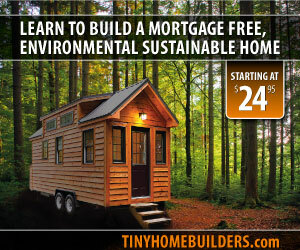 Q – How is your tiny house sustainable? Wouldn’t it be more eco-friendly to buy a used camper? A – This house chose to balance the three main elements of sustainability (the environment, the economy, and society). It is not 100% eco-friendly! If I went for all environmental, I would be broke. If I went for all economic, it would be unhealthy for me and the environment to build. If I just focused on society, then I’d be giving away this house for free. I happen to lean more towards environmental sustainability, but sometimes it’s just not possible based on time and money. As for the specifics of this house, electricity is run from solar, the toilet uses zero water, the fixtures in the kitchen and shower are low flow, I used tons of reclaimed wood, the insulation is recycled, the roof is Energy Star rated, the siding and lumber comes from sustainably-managed forests, and many of the materials came from thrift stores or Habitat ReStore. As for the used camper idea, it depends. Buying used means no demand for new material, but I’d probably have to replace that used camper with another one a few years down the road, and then another, and then another. Also, a used camper would not have been built with environmentally-friendly practices or materials. Q – How much are you selling your house for? A – I’ll have to update this once I do sell it, but for now all I can say is that I’m not sure. Tiny houses range in price from around $12k to upwards of $50k. I’ve seen a lot of people say that asking more than $20k for one is greedy, but then they’ve probably never had to build one of these. If you’re considering buying this one (or any tiny house), make sure you’re paying attention to the quality of materials and craftsmanship. My dad and I built this with care and expertise…he was a general contractor for 30ish years, then a home inspector, and now owns a hardware store. He’s a stickler for quality! His name is on this thing, so it’s been built right. We used 2x4s instead of 2x3s, the best plywood subfloor you can get, splurged on the roof and insulation, and the appliances are pricey because they are for RVs. Plus, I’m including a solar panel and associated gadgets. If you’re looking for a cheap tiny house, this one is not for you. I have a question regarding your pallet wood flooring. The Madison OM build (a branch of Madison’s occupy building tiny houses for/with the homeless community) used pallets for siding (as did Macy Miller). The OM build folks mentioned trying to use pallets for flooring, but that because of varying thicknesses it didn’t work out. How did you process your pallet wood and did you find the same problem? 4. Sort boards based on current thickness (ones that need only a little planing, medium, and lots of planing). It makes it easier when adjusting the planer on each pass if each board is similar in thickness to the others. The rest was the staining and install, which I’m sure you guys are good with! Let me know if I can help again. Is the house still for sale? I live in DC and am interested in coming to take a look and potentially purchase =) please let me know, and thanks! Sorry, it sold a while back. Thanks for looking! My name is Ben Kraft and I am a M. Arch student and research assistant at the University of Minnesota. I am studying Tiny House to help resolve affordable housing shortages for low-income families in rural Southeast Alaska. Currently, I am working on a research framework for the project, which (hopefully) will culminate in the construction of a tiny house by the end of the spring semester. I’ve run into a few articles about your Tiny House Masters Build project, which in turn have led me to your blog and Alt. Habitat website. It is amazing what you were able to accomplish and it gives me hope that I may be able to the same. If you are interested, I would love the opportunity to talk with you about your experiences. You would be a tremendous resource given that very few people have approached and built a Tiny House as a student. I also wanted to give you a heads up that I will likely be citing your work. Hi Sarah. Have you sold your tiny home yet? If so, can I ask how much you sold it for? I live in Fredericksburg and am looking for tiny home options. I did sell the house in 2013. I feel a bit awkward answering that but I will say that purchasing a good quality tiny house will run you probably $20k minimum if you’re not doing it yourself. Some get pricey but I’d set my max budget at $40k if I were personally buying one myself. Good luck in your house hunt! Curious if you know anything about zoning in Northern VA and putting one of these on a lot in Fairfax County. Hey there! I looked that up a long time ago, so I’m not sure if this is still accurate: tiny houses would be looked at as RVs. RVs are not acceptable to live in while parked on your home property (whether there’s a house on the lot or not). Tiny houses don’t qualify as mobile homes (trailers) because they are too short so they’re not allowed in trailer parks. Your best bet in NOVA is too find an RV park, but I’m not sure any are year-round and some may not accept tiny house. NOVA is a tough spot for tiny houses but perhaps you could appeal for some kind of exception. Do you know if I can put a tiny house in my backyard at Fairfax county ? No, Fairfax hasn’t changed their rules and I doubt they ever will. You can probably build it in your yard but no one may live in it.